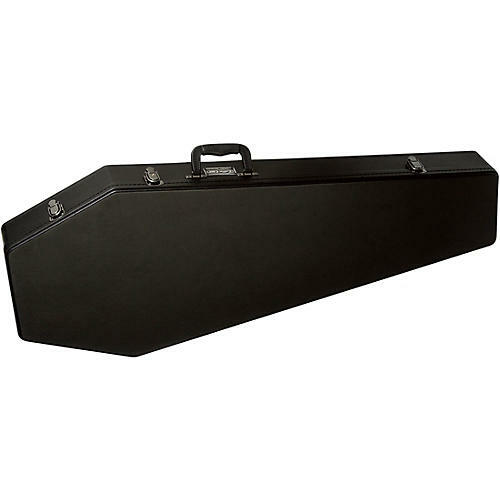 Coffin Case G-185R Universal Guitar Case fits all standard shaped electric guitars. Constructed of solidified, multi-ply laminated wood, this case features Coffin's trademark red velvet diamond-tuck quilted interior and a "shock-resistant" velvet pillow to keep your axe cushioned and resting in peace. A large neck compartment with reinforced wood cross bracing holds your valuable accessories, five black secure steel latches with lock and key and a durable black PVC exterior make this case road ready. Interior dimensions of the G-185 Guitar Case are: 43" x 17" x 3.5". All Coffin Case products carry a one-year warranty against manufacturers' defects. Please contact your authorized Coffin Case Dealer for all warranty claims; however, if you have any questions, please feel free to contact us directly at (818) 760-2180.